This article will describe how to connect your Pardot account to Interact apps. Step 1: Login to your Pardot account and navigate to Settings located in the header menu opened by clicking the gear icon. Step 2: Under the My Profile tab, you will see your API User Key. This is required for the next setup steps. Step 1: In the Interact app builder, under Connect your email list, choose Pardot from the list of integrations. 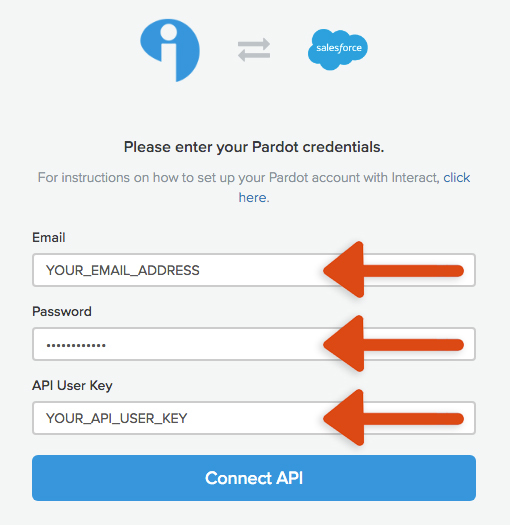 Step 2: Enter your Pardot login credentials and copy and paste your Pardot API User Key, then click Connect API. Add to Contact List: Choose a Pardot contact list from the dropdown to add new contacts to a specific Pardot contact list. Example: For a quiz result trigger, you could connect different results to different contact lists to send autoresponders specific to the quiz result your customers received. 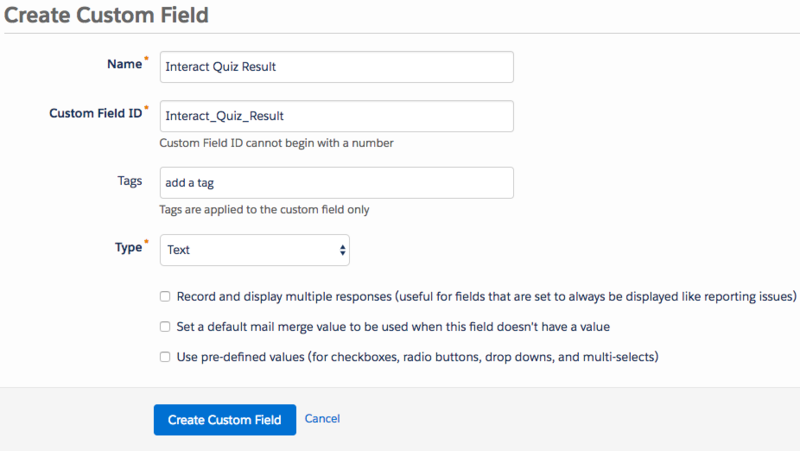 Update Custom Field: Choose a Pardot custom field from the dropdown to update the contact field for new contacts with a specific value. The value will auto-populate with the trigger name, but you can customize this with any value you want. Example: For a quiz result trigger, you could choose the Pardot custom field "Quiz Result Title" from the dropdown and populate the field with the quiz result title for your quiz. Step 1: Here you will find an overview of the way your opt-in form fields are connected to Pardot custom fields. Default fields (cannot be changed): Email, First Name, Last Name, Company Name, Phone Number, Zip Code. Step 2: For all other fields, choose one custom field from the dropdown that you would like to populate with the form value. Example: mapping Company Name to "Custom Field 1" will populate the value inputted for Company Name into the Pardot custom field "Custom Field 1". Will existing Pardot contacts be updated? Yes, existing Pardot contacts will be updated with updated custom field values and be added to new lists. How do you create new Pardot custom fields? Step 1: In your Pardot account, navigate to Admin -> Configure Fields -> Prospect Fields. Step 2: Click Create Custom Field. Step 3: Enter a value for the Name (Custom Field ID should be autofilled) and ensure Type is set to Text. Click Create Custom Field to save all changes. 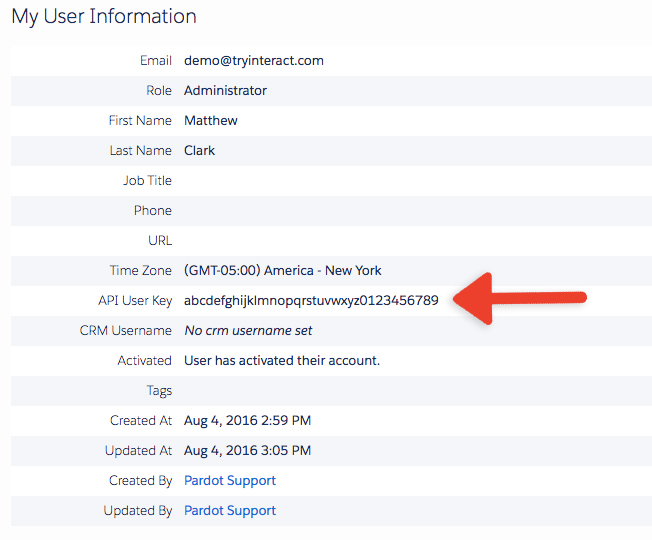 What will a new contact look like in Pardot?